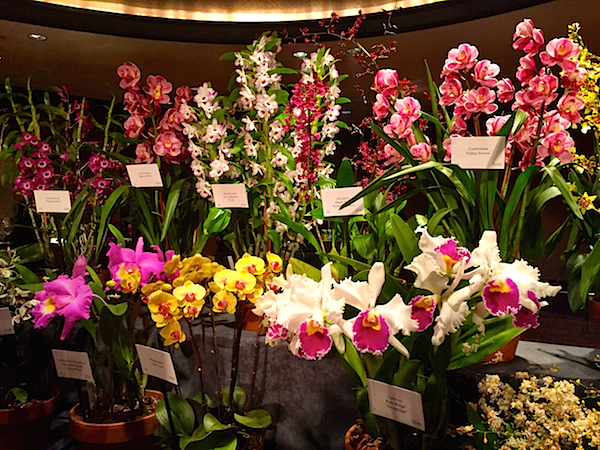 Tuesday night at the Mandarin Oriental in New York marked the New York Botanical Garden‘s Orchid Dinner 2015. 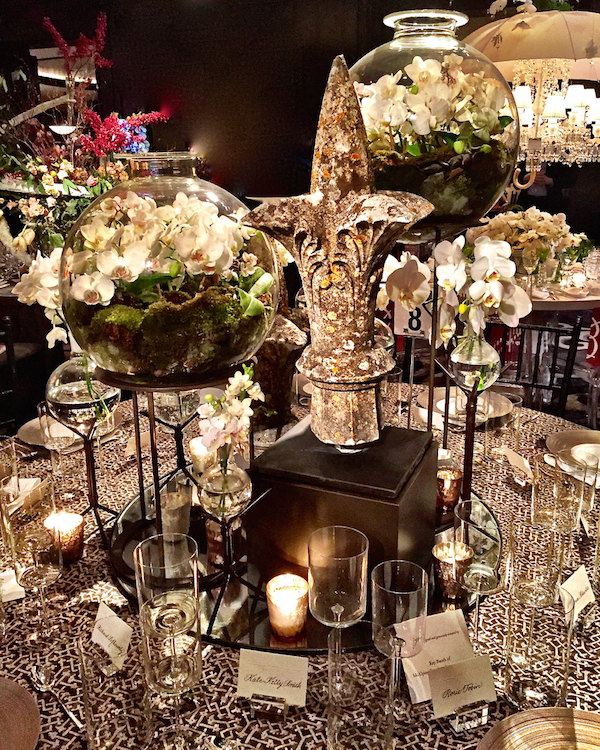 One of my favorite annual events, organized by media sponsor Veranda Magazine, it is always a treat to see the creative designer tables fashioned with unusual orchid centerpieces. 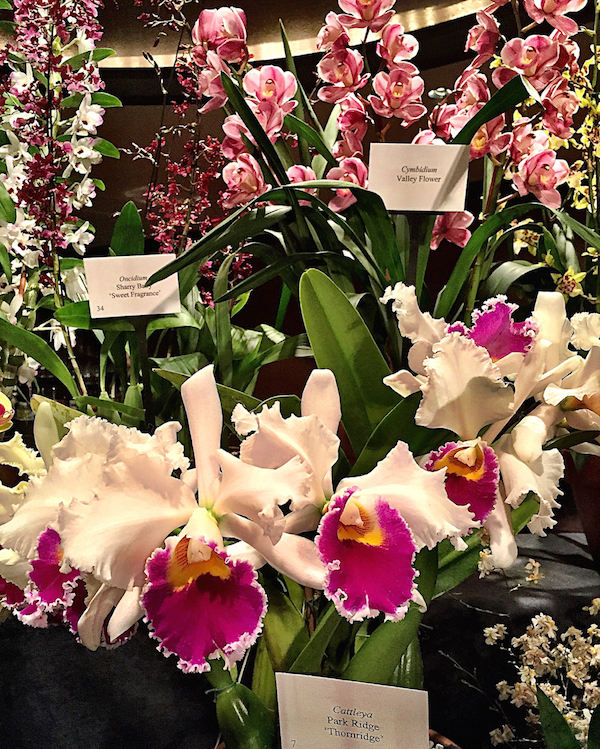 All the proceeds from the evening help to fund the Garden’s very impressive orchid research collection. Before dinner, there are always exquisite plants for sale, including very unusual specimens such as the Cattleya Park Ridge ‘Thornridge’ in front below. 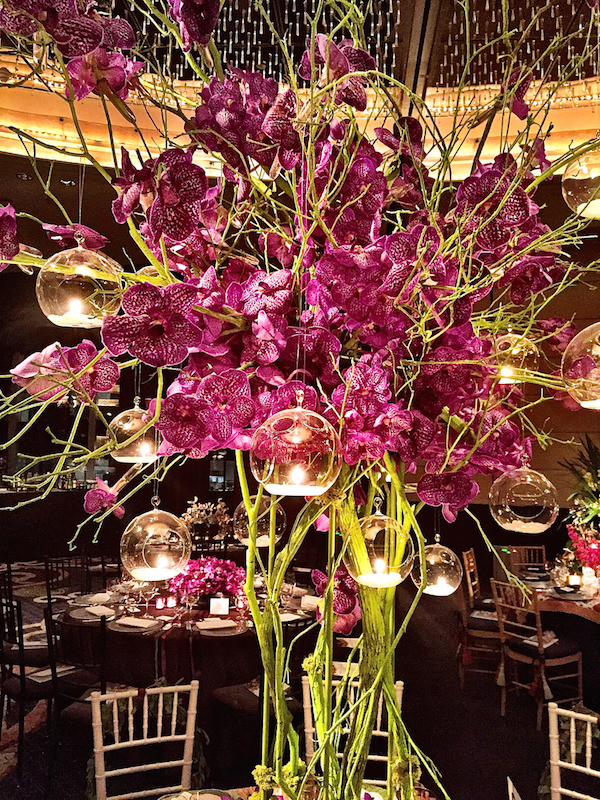 While there was no specific theme for this year’s tables, the Botanical Garden’s 2015 Orchid Show, opening at the end of the month, is entitled Chandeliers. 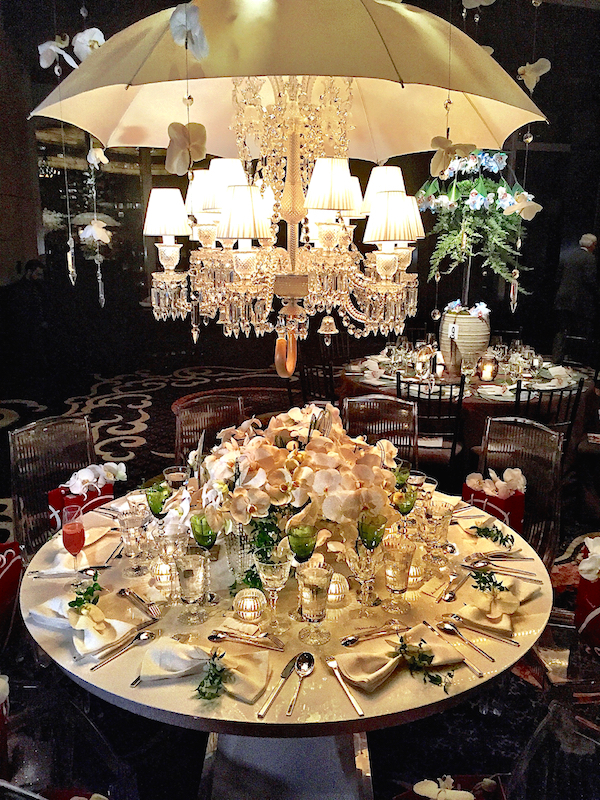 Ally Coulter, in anticipation of the show, and the hopeful arrival of spring, fashioned a beautiful and clever homage in collaboration with Baccarat. 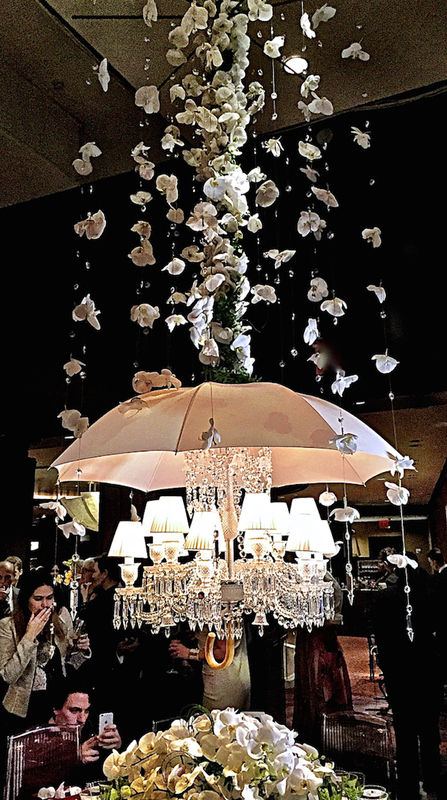 Philippe Starck’s iconic Marie Coquine chandelier, along with a dramatic stream of cascading orchids, referencd spring showers. 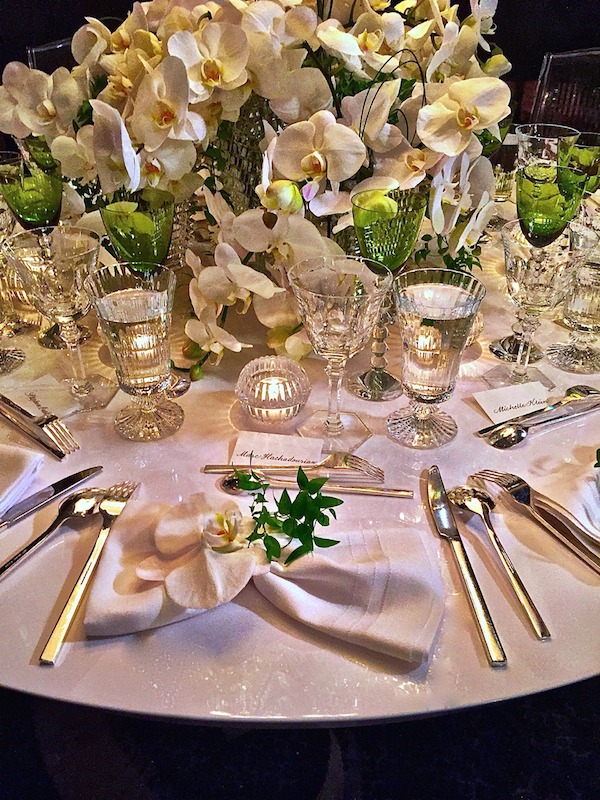 On Ally’s own custom Vincent Table, the tablesetting was a pure post-rain vision with Baccarat crystal, Christofle silver, Dedar linens and splendid orchids from Winston Flowers. Roric Tobin, for Geoffrey Bradfield, always designs such creative tables. This year’s entry, titled Pollack in Paradise, was a colorful exercise in abstract expressionism. 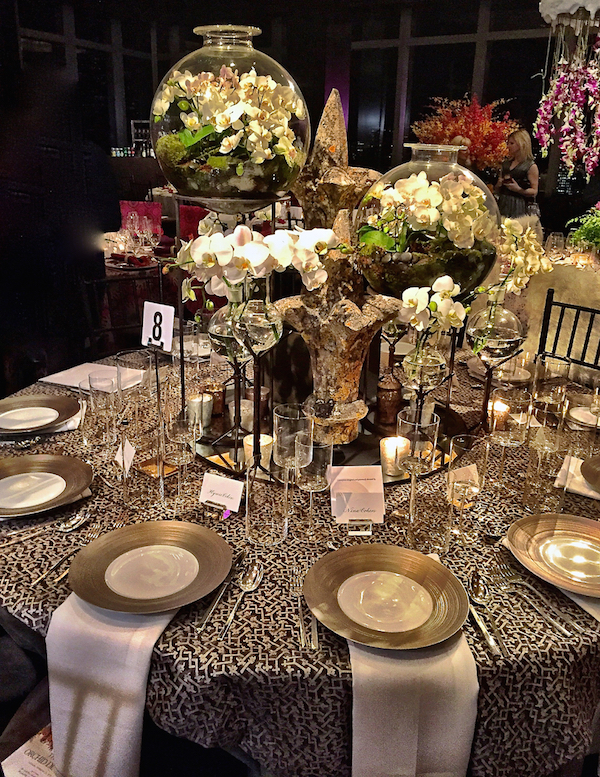 I was lucky enough to be seated for dinner at the elegant tonal “Orchid Alchemy” table designed by Ray Booth of McAlpine, Booth, Ferrier. With pieces from Balsamo Antiques, Revival, Blue Door Framing, and a tablecloth of Fortuny‘s Rabat, the table was a refined organic mix of shapes and materials, topped with globes of beautiful orchid arrangements, as if the result of his design chemistry. 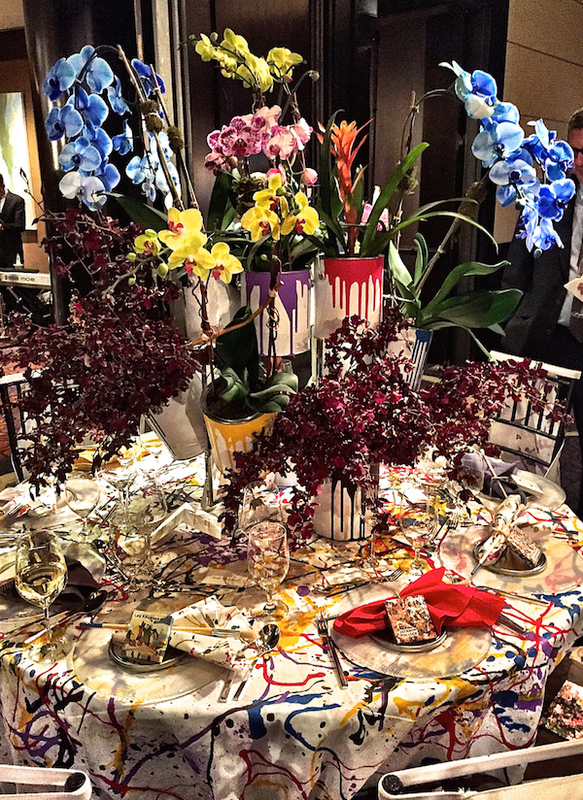 With his first table for the event, Frank de Biasi created a setting echoing the unique and distinctive nature of orchids’ beauty. 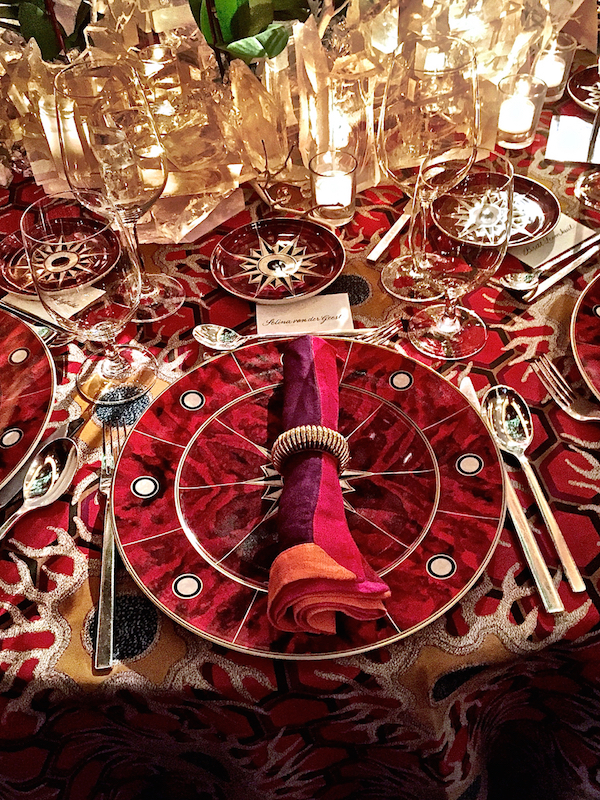 With customized elements from around the globe, Frank included his own design for a wood-block printed tablecloth, Gayle Warwick‘s hand-embroidered orchid linen napkins from London, William Yeoward‘s amethyst goblets, basket weave Italian chargers from Este Ceramiche Porcellane and French flatware from Alain Saint-Joanis. 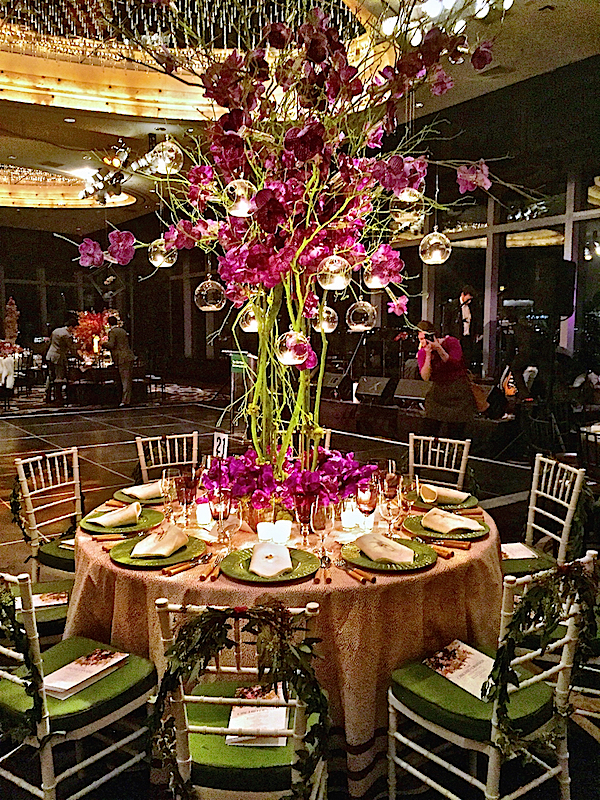 Within the classic green and purple orchid colorway, Frank used his individualized approach to design to create a table filled with special yet harmonious details. 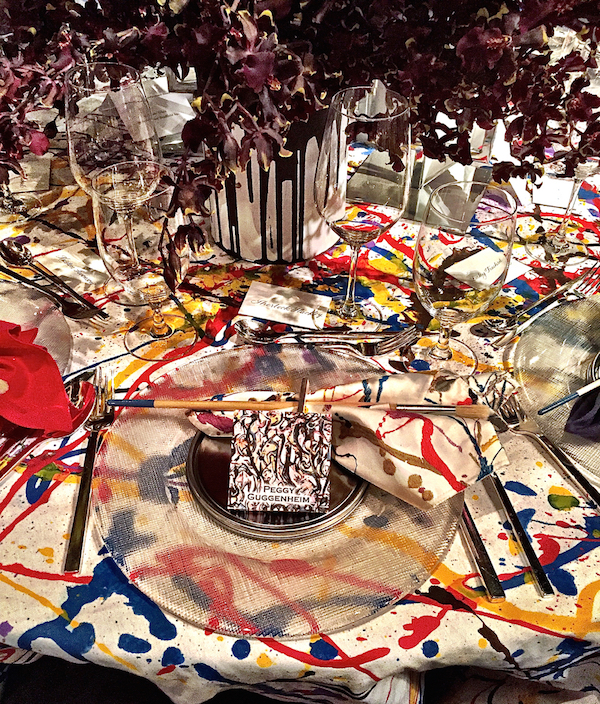 Hutton Wilkinson and floral designer Brett Leemkuil created a table full of signature energetic color and pattern for Tony Duquette. 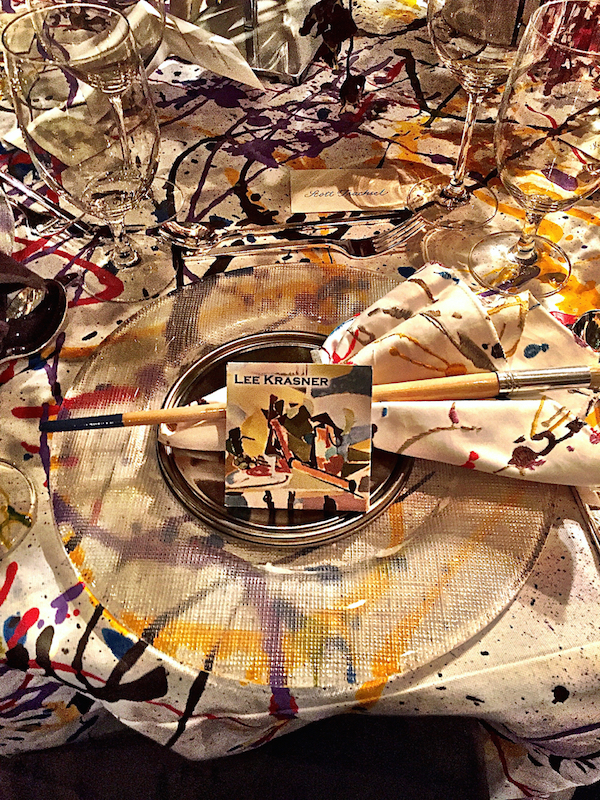 Using the brand’s Tortoise dinnerware for Mottahedeh and their emblematic Tibetan Sun for Jim Thompson, Hutton layered a vibrant and lively table befitting the artistic legacy of the studio. 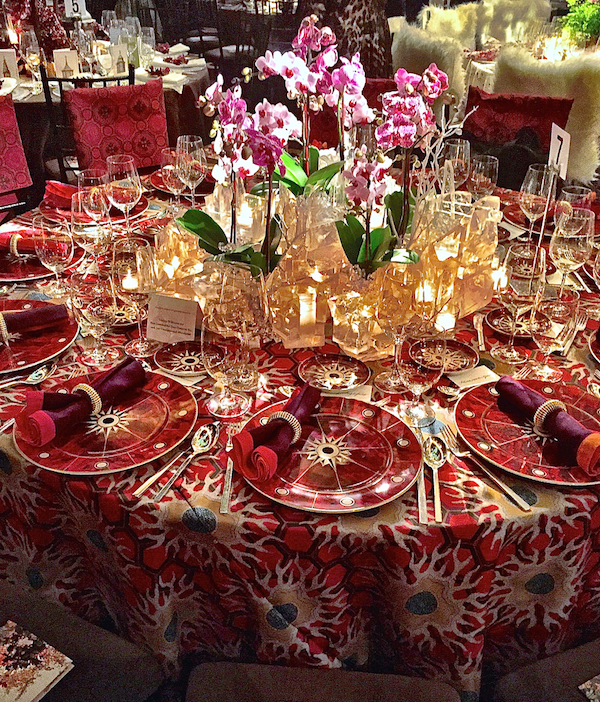 Stop back tomorrow as we look at more stunning tables from the NYBG’s Orchid Dinner 2015. This entry posted in garden, interior design. 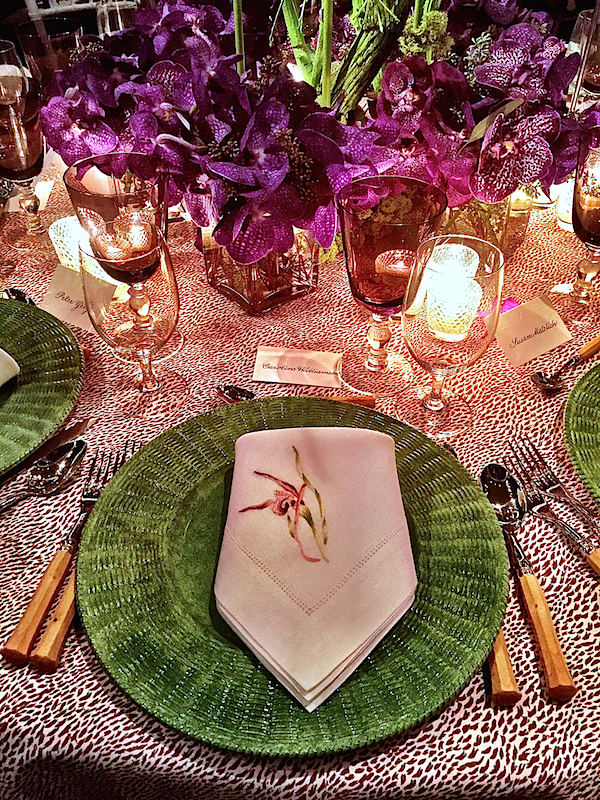 Entry Tags: interior design, New York Botanical Garden, Orchid Dinner 2015, Orchids, Tabletop, Tabletop events Bookmark the permalink. I always look forward to seeing your coverage of this dinner, and you didn’t disappoint. Can’t wait to see the others. I will be pinning away! Stacey I am swooning over the last table by Hutton, all are amazing though and I love, love orchids! You attend the BEST events! Thanks for capturing the event so beautifully. I can always count on you to make me feel as if I was there. Bravo! 80 queries in 0.509 seconds.